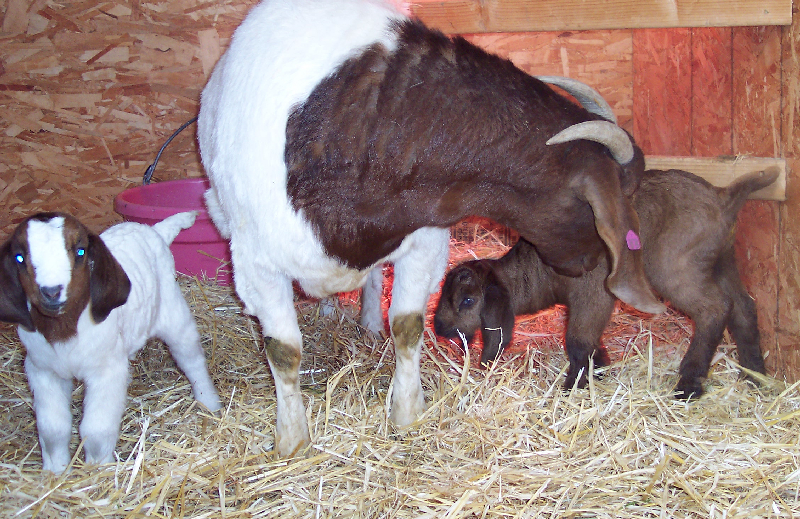 Lost Prairie Farm, LLC - Welcome to Lost Prairie FarmBoer Goats in Montana! Boer Goats at Lost Prairie Farm Montana Boer Goats! 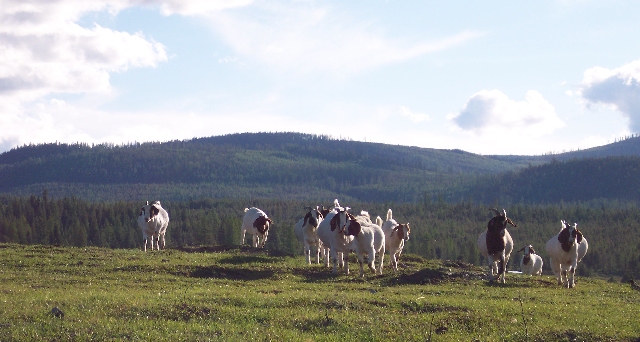 At Lost Prairie Farm, we raise quality Fullblood (100%), Purebred (94-99%) and Percentage (50-88%) Boer goats in Northwest Montana.﻿ We carefully cull to ensure only the best traits are passed down. 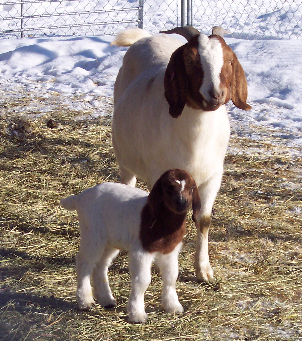 Our focus is producing quality Boer goat breeding stock for Boer goat breeders and producers in Montana, Idaho, Washington, North Dakota, South Dakota, Utah, Wyoming and Canada. 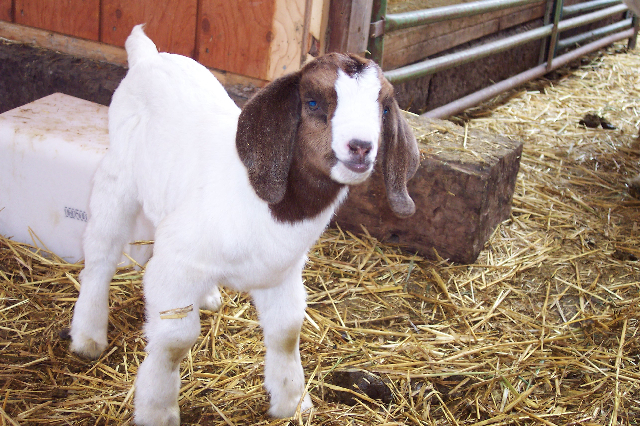 We breed our Boer goats for quality, hardiness, strong maternal traits and healthy rate-of-gain. We offer ABGA and USBGA registered along with commercial stock. Our animals are raised in a natural environment with lots and lots of love and attention. They are free to roam acres of pasture where they can browse and fresh water is always available. 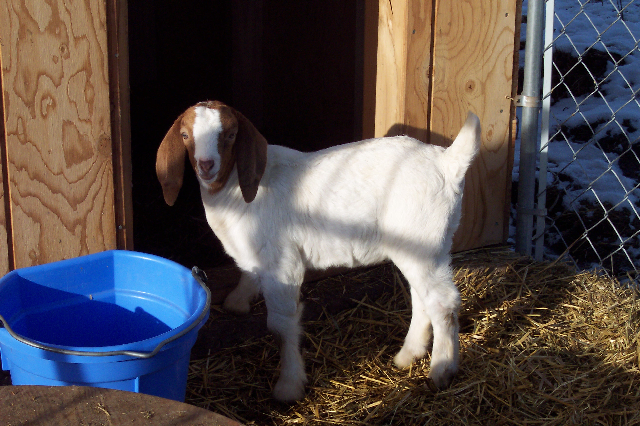 During the winter months, our goats are fed pesticide-free hay cut from our pastures. 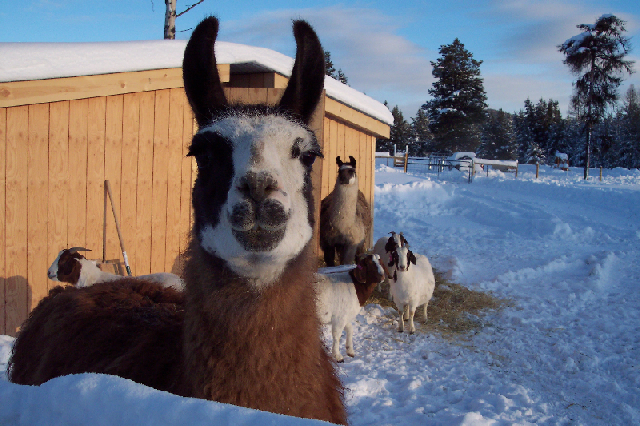 We are currently using llamas as livestock guardians for our Boer goat herd. Tacky and Andy are always looking out for their charges! 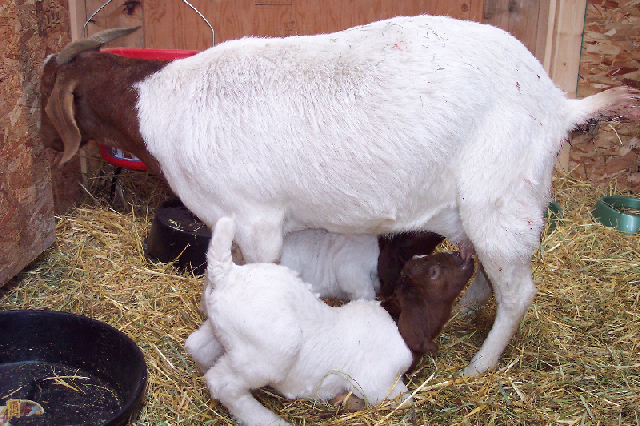 Our market goats are "all natural" grassfed, pasture/browse raised ... no antibiotics or growth hormones. They grow a bit more slowly than grain-fed kids, but the end result is definitely worth a few less pounds of meat! Goat meat is called "chevon" and is delicious! It's a very healthy meat. We typically kid March and April. If you're interested in our 2019 kid crop, please contact us and let us know what you are looking for. We'll add you to our waiting list. No deposit required at this time. We operate a carefully maintained herd and breed for quality, soundness, muscling, depth, correctness, easy kidding and good mothering ability. 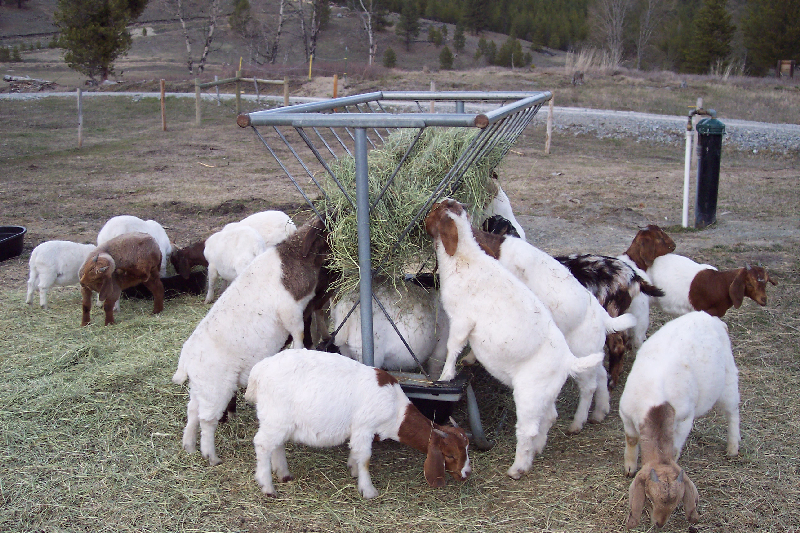 Our primary goal is not to produce "show/club goats", but rather sound, productive and very hardy breeding stock that thrives on a "no fuss" diet. We also strive to produce a more parasite-tolerant Boer. Northwest Montana offers many weather challenges, from -40 below zero degrees during winter to 100+ degrees in the summer. Our goats are Montana hardy! Dancer of Lost Prairie with her twin doeling Feather. Livestock guardian's Andy and Grecco always greet visitors! The Lord blessed us in November when eyesight was returned to our senior Boer doe and herd queen Elvira! The Lord guided us with appropriate treatment and we thank Him every day!﻿ Elvira is doing great! 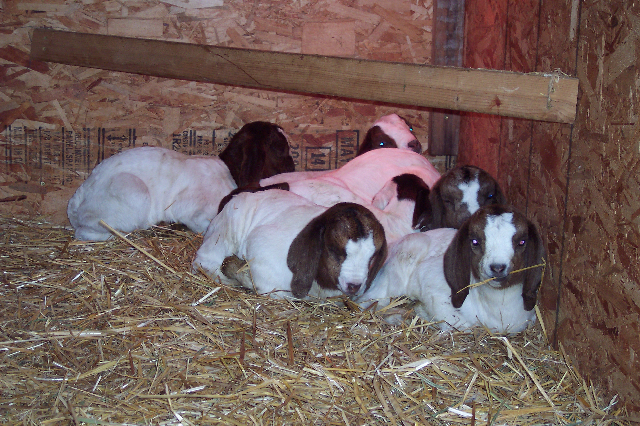 Interested in raising Boer goats? Have Questions? Please contact us anytime! We LOVE to talk goats! We look forward to hearing from you.